You are currently browsing the category archive for the ‘Temptation’ category. Stop telling gay people that if they come to Jesus, he will make them straight. People have often used my story to point others to what they believe should be the immediate fruit of their repentance. I was a lesbian who came to Jesus and eventually ended up married to a man, giving birth to two daughters. According to them, I am living happily ever after in a state of heterosexual bliss. Clearly, my life as it is now may have its share of blessings, but it has been far from blissful. And even though God may have called me in particular to marriage, that doesn’t mean he’s called everyone to it in general. My marriage, with all of its difficulties and beauty, is glorious to God because it is a picture of God’s gospel (Ephesians 5:32). But it is not the ultimate glory. Christ is. That is what makes “the heterosexual gospel” so problematic. It tends to put more emphasis on marriage as the goal of the Christian life than on knowing Jesus. What the gay community needs to hear is not that God will make them straight, but that Christ can make them his. In this age, they may never be “straight” (for lack of better words), but they can be holy (1 Corinthians 1:30). We must remind others (and ourselves) that Christ is ultimately calling them to himself — to know Christ, love Christ, serve Christ, honor Christ, and exalt Christ forever. What Are the Five Stages of Resistance? First, there was simple resistance. Then came the open ideological stance that characterized the churches and men like Bishop von Galen, Martin Niemoeller, and Bishop Worm, although they did not conceive of a new political future and work towards it. Third, there was the stage of being informed accessories to the preparations for the coup, some church official such as Asmussen, Dibelius, Gruber, or Hanns Lilje belong in this category. Then came the fourth stage of active participation for the post-revolt period; its most representative was Moltke, but Theodor Steltzer, Harald Poelchau, and Oskar Hammelsbeck were part of this as well. Finally there was the last stage: active conspiracy. Very few made it to the fifth stage. Bonhoeffer was one of them. (Editor’s Introduction to the English Edition of to Dietrich Bonhoeffer Works in Volume 16: Conspiracy and Imprisonment: 1940-1945, 9). In this enlightening study, renowned twentieth-century theologian Dietrich Bonhoeffer offers a careful textual analysis of the story of creation, approaching the biblical tale with the eye of a philosopher and the soul of a true Christian. “Creation and Fall” is Bonhoeffer’s lucid, brilliant analysis of the first three chapters of Genesis. Here he discusses the seeming scientific naivete behind the creation story, God’s love and goodness, and humanity’s creation, its free will, and its blessedness. Bonhoeffer also tackles difficult questions that are raised in the first book of the of the Bible, questions about the seemingly redundant second story of creation, about God’s own beginning, about the source of the light that was created on the first day. The author then expounds on Adam and Eve’s fall from grace: How could they, creatures made in God’s image, have thought to oppose God so foully? Where did the first evil come from? How did humanity lose its right to live in paradise? In “Temptation,” Bonhoeffer questions how temptation appeared in the midst of Eden’s innocence, and he explores the very nature of evil. Bonhoeffer explains that Jesus Christ helps us to understand and conquer physical and spiritual temptation through His grace and goodness. Dietrich Bonhoeffer explains in his work, Creation and Fall; Temptation that that when we are tempted, there is help from heaven. Believers suffer the hour of temptation without defense. Jesus Christ is their shield. And only when it is quite clearly understood that temptation must befall the Godforsaken, then the word can at last be uttered which the Bible speaks about the Christian’s struggles. From heaven the Lord gives to the defenseless the heavenly armour before which, men’s eyes do see it. The prayer of Jesus Christ which he promised to Peter: “Simon, behold, Satan has asked to have you, that he might sift you like wheat, but I made supplication for thee” (Luke 22.31) represents our weak prayer before the Father in heaven, who does not allow us to be tempted beyond our powers (143). Bonhoeffer’s reflections on the nature of temptation and how to resist it are profound and if you haven’t read them, you should. Temptation is such a horrific thing precisely because the enemy with which you are faced is you. You are your own Judas. You must combat your sinful desires with your holy ones and often, considering the strength of your holy desires, your prospects of overcoming temptation do not look good. It is not a matter of strength of will, for the will is the instrument, the modus operandi, of virtue and vice alike and the stronger the will, the more easily it can act in the face of conscience. Even your pious powers do not really overcome temptation for in overcoming your Corinthian self by reliance upon your piety alone you become your Pharisaical self instead. The only antidote is being remade by Him who makes all things new. Here I preceive the forsakeness and abandonment of any fleshly condition and the rightoues judgement of God’s wrath on all flesh. Here I know that in this lost condition I could never have helped myself against Satan, but that it is the victory of Jesus Christ which I now share. But here also I find ground for the attitude in which alone I can conquer all temptations–for patience (James 1.2ff). I ought not to rebel against the temptations of the flesh in unlawful pride, as though I were too good for them. I ought to and I can humble myself under the hand of God and endure patiently the humiliation of such temptations. So I discern in the midst of Satan’s deadly work the righteous and merciful punishment of God. In the death of Jesus I find refuge from Satan and the communion of death in the flesh under temptation and of life in the spirit through his victory (133-134). But how often do we do look to our crucified savior when we are tempted? 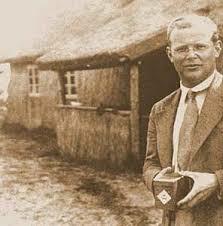 Dietrich Bonhoeffer’s Description of Tempation (Part Seven): Flee From It and Run to Jesus! Therefore the Bible teaches us in times of temptation in the flesh to flee: “Flee fornication” (1 Corinthians 6.18)–“from idolatry” (1 Corinthians 10.14)–“youthful lusts” (2 Timothy 2.22)–“the lust of the world” (2 Peter 1.4). There is no resistance to Satan other than flight. Every struggle afainst lust in one’s strength is doomed to failure.